EMPTY NEST GENEALOGY All things history and genealogy. Learning of this online newspapers archive site was very exciting to me. Some of the most valuable information we can find in our genealogical search comes from newspaper accounts because they provide a more detailed reflection of the lives of our ancestors – not just facts and figures. I have added this link to the main ‘Genealogy Links’ page in the top menu. The Online Newspapers Archive site endeavours to centralize the thousands of historical newspapers from various sources in one location. The first newspapers I looked for were those in the Acadian territories of Nova Scotia and New Brunswick before, during and after the expulsion. My family names do show in the papers available after 1850, but it will take some time to sift through them. The newspapers for Pennsylvania, New York, Illinois and Kentucky also look promising as a great deal of our family history took place in these states. One great disappointment, though is that there is nothing yet for the United Kingdom. Although there are great gaps in the newspapers available for some geographical regions, what is available could provide that ‘gem’ one or more of us have been seeking. I definitely intend to investigate this site further. In my 12+ years of genealogy experience, I have become very attached to the Google tools, tips and tricks for genealogy research! Once I discovered these tools, I haven’t looked back. I use them frequently in the course of my research. This is the one Google search tool I use most often – and therefore I’m listing the direct link here. It creates a series of searches using different groupings of keywords from the input boxes for given names, surnames, birth and death places. Use (“) quotation marks around a specific word or phrase to be included “as is” in your results. This tool is valuable for finding websites with specific surnames in the title, most especially when surnames are also common English words in every day use such as ‘Mason’ or ‘Forest’; are also ‘given’ or ‘first’ names like ‘James’ or ‘Stuart’. In addition, this search helps to delve into more obscure sites that are deeper in Google results. An inordinate amount of valuable genealogy data exists within books and publications that in the past were not easily searchable. Google has taken great strides in digitizing ‘in copyright’ and ‘out of copyright’ material for access online. This tool searches the full texts of books digitized by Google. Although not as high in quality as vital records such as births, deaths and marriages, when such records are not available or cannot be found, this is the next best thing. A great benefit of material obtained this way is that it is frequently in narrative form, recounting actual events and circumstances, adding ‘flesh’ to the ‘bones’ of most genealogy research. Tool for searching within other blogs. This can be very helpful for finding data compiled by other genealogists who have their own blogs. Search for obituaries, news stories or other items appearing in newspapers. Be sure to use the surname as well as specific keyword(s) in your search. Enter the keyword(s) and relevant site name in the appropriate boxes and select either ‘only with’ or ‘excluding’ in the drop-down box. Enter the url of a site you’d like to use as an example. Useful for finding similar sites on a specific topic. GEDCOMS are valuable files created by genealogy software for easy transfer and import of data in a manageable size. For this to be useful, it is necessary to have software to either convert to a viewable format or with the ability to import. Newsgroups are online communities of like-minded researches who post information, queries and answers. To limit results to just genealogy sites, add the word ‘genealogy’ to the search string. The Google Dictionary searches for definitions for dated words, terms and acronyms. Very useful for finding the meanings of old-fashioned terminology frequently used in genealogy data and research. An amazing tool for calculating are or distance using old-fashioned words and phrasing (i.e. calculating dates using mathematical functions: [1927-82] or converting old fashioned measures into contemporary measures (i.e. 40 rods in miles). If an immediate result is not shown, the page will likely list another calculator to use (i.e. arpents – no answer shows, but an arpent calculator appears toward the bottom of the results page). A tool to search for images by keyword using file type and size filters. This is actually quite an amazing little tool. I always use it when reseraching and I’m constantly amazed at how many images it finds on obscure websites that I never would have found. Perform a keyword search filtered by location using address, city, state, and or code. This tool is invaluable for those seeking to search websites in a specific language and/or from a specific country. A quick and easy tool for translating snippets of text. Select the languages of conversion from the drop-down box. To translate a full web page, type the full url (including ‘http://’) into the search box and select the languages of conversion in the drop-down box. This is the one Google tool I use the most. It’s ideal for searching for specific combinations of names and relationships, thereby eliminating a great deal of ‘chaff’. Every keyword search produces a set of links in the ribbon across the top of the screen. Click on ‘Images’ to go to only image results. Then, across the top of every Google image results page is a list of any ‘related search’ links that exist. Just hover over a link to view a preview ribbon of images from that search. This search can be very useful for trying to identify photos by individuals, locations, etc. by uploading the photo for Google to compare to other photos on the Internet to finds similar photos. Searches can be filtered for only faces, clip art, high-res, etc. When signed into Google+ and with the search options set to allow personal results, Google will highlight results from within your own Google+ community with this icon. If you wish to toggle personal results off, just click on this icon in the top right of your screen. To make sure certain words are included in the search without regard for order, use the ‘+’ symbol (i.e. Christian +Keefer). Likewise, to exclude words, use the ‘-‘ symbol (i.e. Christian -Keefer). Use quotation marks at the beginning and end of the string that you wish to be exact in your search results (i.e. “Christian Keefer”). Wild card searches are especially effective in genealogy. With Google, the ‘*’ can be used in place of a word if there could possibly be more than one choices in a phrase or if you don’t know what the word might be. For a wildcard search, insert the ‘*’ wildcard in place of the word(s) in question. (i.e. “Christian Keefer” “* Jacques”). In this example, the missing first name is represented by the ‘*’ and search results come up showing several possible first name possibilities. Despite our first instinct to throw as many words as possible into a search, this actually can defeat the purpose. The extra words will most likely result in unrelated results due the the extra word(s). Start with as few words as possible and add ‘key’ words to your search in an attempt to narrow your results. To search only specific sites, add the ‘site:’ prefix to the desired url (i.e. site:emptynestthemes.com). You can also search specific site types, domains and/or countries signified by a url suffix. Just add the same site prefix when searching (i.e. ‘site:edu’ for education sites; ‘site:ca’ for Canadian sites). To find related websites, use the prefix ‘related:’ in front of the site’s url (i.e. related:emptynestthemes.com). To search for specific file types, use the ‘filetype:’ prefix in front of the desired file extension within your search string (i.e. filetype:png chilliwack schools). To find definitions with Google, use the ‘define:’ prefix in front of the term to get a list of definitions from several online dictionaries. Search for any numbers in a specific such as price ranges by placing two dots ‘..’ between the two numbers (i.e. Chilliwack real estate $100,000..$300,000). Google can be used as a calculator. Just type in the equation using symbols to represent the functions. (i.e. 100*10, 100/10, 100-10, or 100+10). The first entry in the search results page will be the answer to the equation entered. Ancestry.com and FamilySearch.org Updates and Additions to 7 May, 2015.
and FamilySearch Updates and Additions to 7 May, 2015. A federal grant from the National Endowment for the Humanities has paid for a Vermont Digital Newspaper Project planned to take two years for scanning up to 100,00 pages from Vermont newspapers of the 1800’s and early 1900’s, providing highly sought information about Vermont ancestors of researchers. Vermont is only the first of 28 states expected to contribute to this project, which will be known as “Chronicling America”. Spearheaded by University of Vermont librarians, the url for the coming online digital archives is to be announced once any images are made available online. This has the potential of being an invaluable resource for those doing family genealogy research in Vermont. Newspaper articles are particularly valuable as they help to provide the historical details of events and circumstances that are missing from official records commonly used in genealogy research. and FamilySearch.org Updates and Additions for the week ending September 11, 2014.
and FamilySearch.org Updates and Additions up to and including August 6, 2014. Ancestry.com and FamilySearch.org updates and additions, 29 July, 2014.
and FamilySearch.org updates and additions up to and including 29 July, 2014. 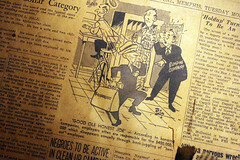 Following are the genealogy news bites and headlines up to April 10, 2014.